Rehabilitation Professionals like Speech Language Pathologists and Audiologists are key Players on our Client Care Teams. Injury Resources > Personal Injury Blog > Rehabilitation Professionals like Speech Language Pathologists and Audiologists are key Players on our Client Care Teams. This past week, Murphy Battista LLP was pleased to sponsor Dr. Julie Wambaugh’s lecture on “Evidence Based Practice and the Treatment of Acquired Apraxia of Speech” at the 2014 Conference of BC Association of Speech Language Pathologists & Audiologists held October 23-25, 2014. Click to view Powerpoint of Dr. Wambaugh’s presentation. The festivities started Thursday evening with a meet-and-greet for all speech language pathologists (or SLPs) as well as people from other related disciplines. Friday and Saturday were packed with seminars and speakers on a variety of issues in the field. During the breaks of the conference, participating sponsors had an opportunity to showcase their services to industry professionals. The turnout was great, and the overall mood positive throughout the three days of the conference. Speech language pathology is a specialized branch of therapy involved in treating communication disorders. It focuses on pronunciation, pitch variation, and respiration with respect to speech, and sound manipulation, understanding meaning, constructing sentences, interpreting symbols, and social aspects of communication with respect to language. It is often used to assist children and adults who suffer learning disabilities. In a rehabilitation context, it can be employed to assist people who have suffered a stroke or a traumatic brain injury and need assistance re-acquiring communication skills. 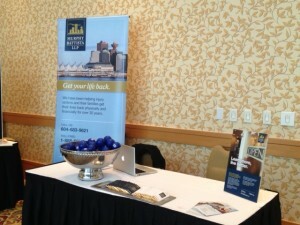 Dianna Robertson and I staffed the Murphy Battista booth at the event. A question we were asked on more than one occasion was “Why are you here?” The answer is simple. Murphy Battista’s client base includes a significant number of people who have suffered head injuries during an accident and who are at various stages of recovery. A person may come to Murphy Battista immediately following an accident, after they have received assistance in some (but not all) areas of their rehabilitation, or after they have completed a significant amount of rehab. It is important that the lawyers at Murphy Battista are able to help people with all aspects of getting their lives back. This includes giving them access to information about all available avenues of rehabilitation. Speech language pathology is one of these avenues, and for people suffering certain injuries, it can be one of the most crucial. 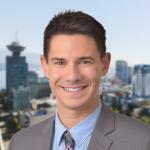 By staying up-to-date on the latest developments in the field as well as building relationships with professionals in specific disciplines within the field of rehabilitation, Murphy Battista lawyers can ensure they provide clients with the best and most informed advice and opinions on all aspects of their recovery. 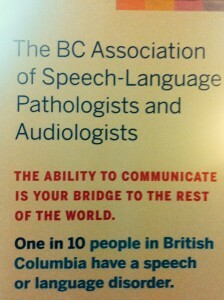 For more information on speech language pathology, please check out the BCASLPA website. If you or someone you know is working with an SLP and would like more information on whether you have a legal claim, we invite you to contact us.